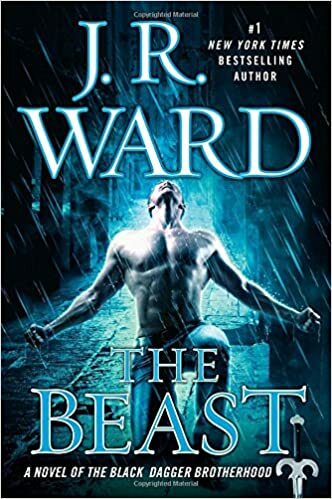 I’ve loved every book I’ve ever read by J.R. Ward. The Beast was another winner. The Black Dagger Brotherhood series as a whole may very well be my favorite series of all. It “may” be my favorite because as a bookworm I hate to pick definite favorites. What is so great about her writing is that she manages to have each book focus mainly on two people, and yet there are at least 3 or more side stories going on that you equally care about. I’ve read several books that veered off the main story line for other characters and it really made me want to skim pages. Ward manages to keep you entertained and caring about EVERY character in a story. The Beast revisits Rhage and Mary, a love match made in “Lover Eternal“, book 2 of 14. Rhage is one of my personal favorites in this series. He and Mary face new challenges in their relationship that they didn’t anticipate when they got their forever-after together. A life with each other was supposed to be enough, but maybe they were wrong. Even the strongest relationships fall on hard times. Moving on to the side stories. Will Assail beat his addiction to cocaine? Will he ever get a chance at a life with his human love? Layla is giving birth to twins with Qhuinn and his lover Blay. How will the parenting trio manage this feat when Layla is secretly in love with Xcor, enemy #1 of the brotherhood? Xcor is currently imprisoned by the brotherhood until he wakes from his coma. Will he be allowed to live after nearly killing the king? The odds aren’t good for Xcor, but Layla has discovered something of his lineage that just might save him. Layla and Xcor will have their fates settled in the next book of this series, The Chosen. Is it necessary to read this 14 book series in order, plus the 2 from the spin-off “Blood Legacy” series? YES, yes it is. If someone told you to binge-watch a series on Netflix this Saturday, would you start at the last episode? No. Be grateful that you get to binge-read one of the best Vampire series ever written (start here if you’re new to this series). Honestly, I’m jealous of you. I had to wait years for all of these books.